He seems to ignore Poroshenko's invitation for 14 April. 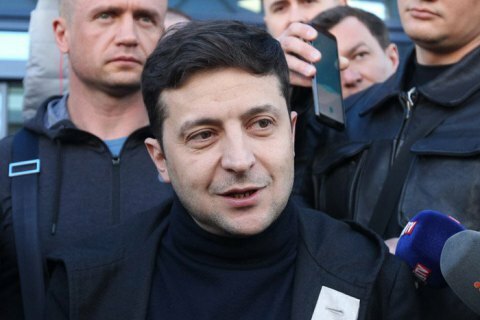 Presidential election frontrunner and showman Volodymyr Zelenskyy has said he will meet his competitor, incumbent President Petro Poroshenko for a debate at the Olympic Stadium in Kyiv on 19 April. In a video posted on Team Zelenskyy's Facebook account, he said he would "be able to ask Poroshenko any question". He called on his supporters to send in the questions. Earlier, Poroshenko invited him to hold a debate at the Olympic Stadium on 14 April. The Central Electoral Commission said that under the law an official public debate between the two candidates must be held in the studio of the National Public TV Company of Ukraine on 19 April. Zelenskyy and Poroshenko proceeded to the runoff set for 21 April after none of the candidates managed to receive 50% or more of the vote.